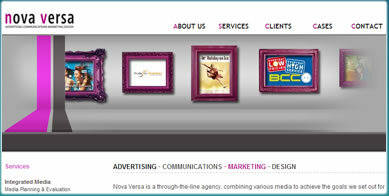 Nova Versa is one of Europe's leading advertising agencies based in The Netherlands. They recently commissioned Sasha to turn their elegant design into a fast loading and dynamic web site that would showcase their best work and outline the services they provide to potential new clients. There are web sites and then there are effective web sites. Stand out from your competitors with a professionally designed web presence that is tailored to your needs. A web site that produces measurable results can be achieved at an affordable price. "Again (still!) many thanks for all your hard work on this project."